Have a Project in mind? Need Options? 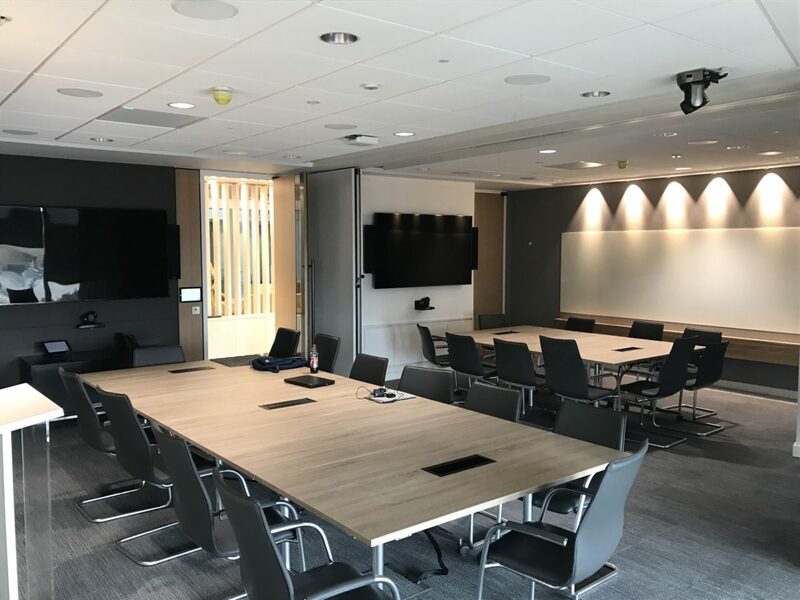 The objective was to provide employees, important clients and delegates a vastly superior meeting experience, and enable teams/employees around the world to collaborate in these workspaces. 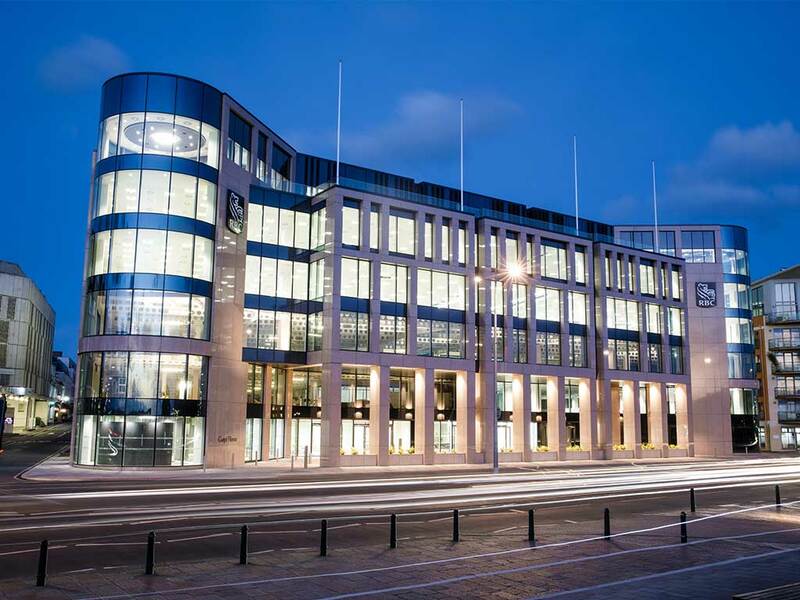 This is a major new office development, and the largest single office development in the Channel Islands. The divisible meeting room is made up of two side-by-side rooms with a folding wall in between. Each of the rooms function as standalone presentation rooms or both rooms as one, larger, combined room. 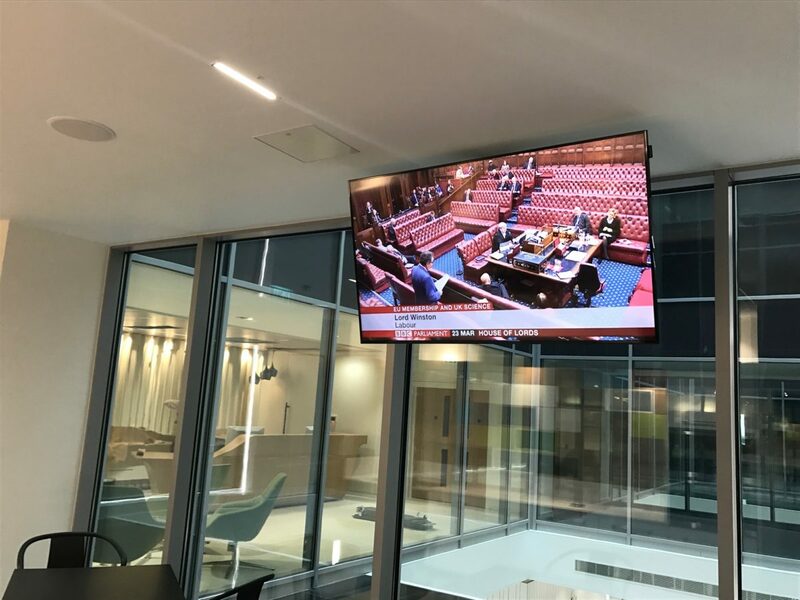 1x Samsung 95” FHD display wall mounted on a purpose designed and built line bracket. 1x Samsung 75” FHD display in the larger room for use when in combined mode. 2x Shure Microflex Ceiling array, 6x KEF Speakers, 3x Extron DANTE amplifiers, 10x Harman 4” compact ceiling speakers. 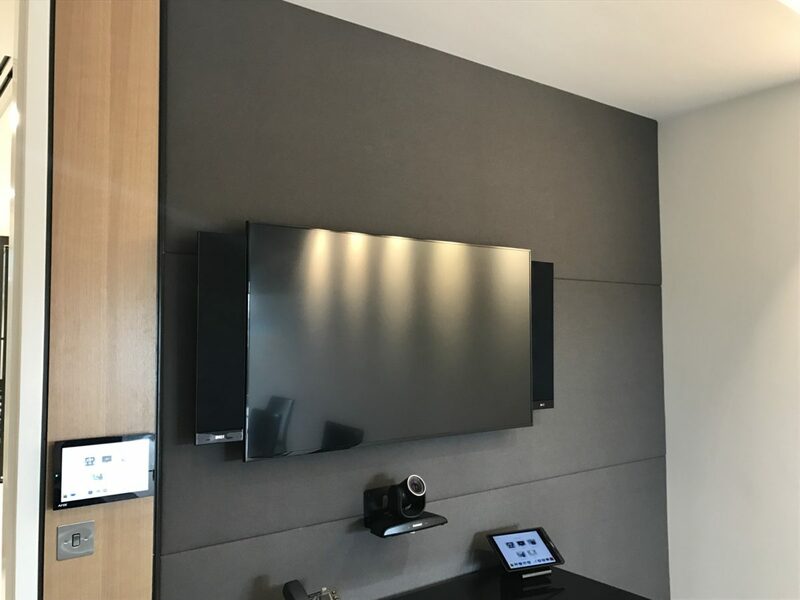 Video Conferencing: 1x Wallmounted Lumens Full HD PTZ USB Camera with a video conferencing codec and Vaddio AV Bridge (located in the central equipment racks with USB extended back to the room for the user’s laptop connection). The HDMI output of the camera run via the AMX DGX FIBRE infrastructure back to the centralised racks. Outputs of the DGX are then used to feed the codec and AV bridge as required. 10” AMX wall mounted touch panel should be provided in each room. Low-Profile Ceiling Mount Occupancy Sensor: occupancy sensor in the ceiling connected to the control system. 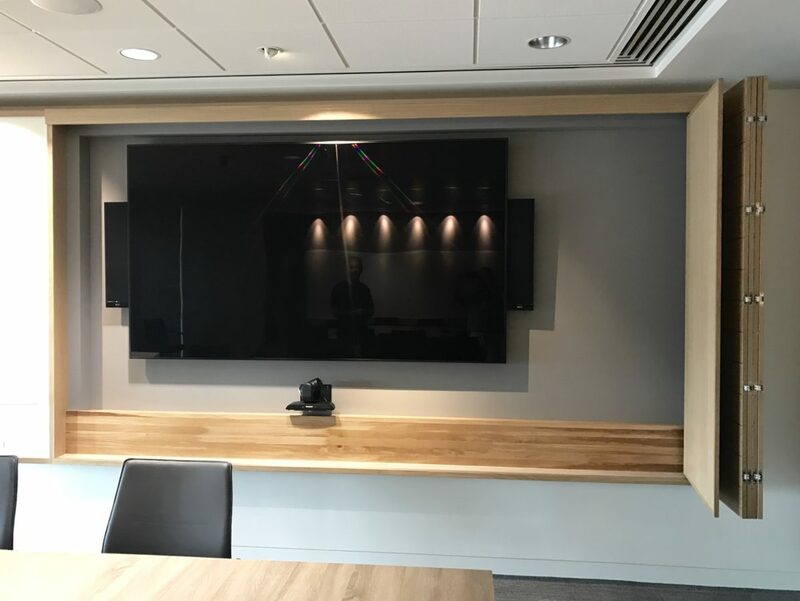 Optical switches installed to monitor the state of the dividing wall, to provide relevant audio visual settings alongside a master override. Polycom RealPresence Trio 8800 (Skype for Business/O365/Lync Edition) and Logitech C930 camera for full video and audio conferencing. KEF speakers with Extron Amplifier. 10” AMX wall mounted touch panel. 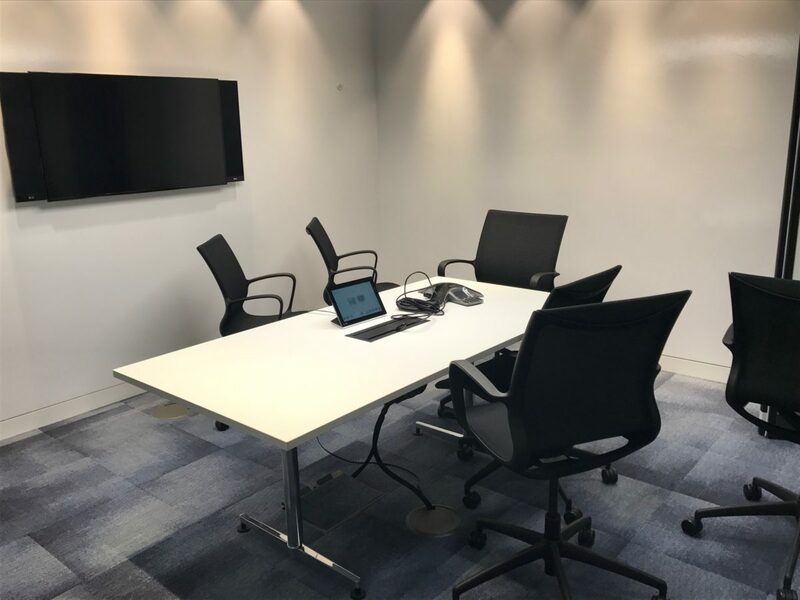 The Dual-Purpose Office is a space used either as an individual office or as an ad-hoc meeting space depending on the requirement at the time. Samsung 40” FHD wall mounted on a purpose designed and built line bracket, and secondary desk-arm mounted monitors. Extron HDMI DA2 two out HDMI distribution amplifier to split the output of the Employer supplied PC docking station to both monitors. 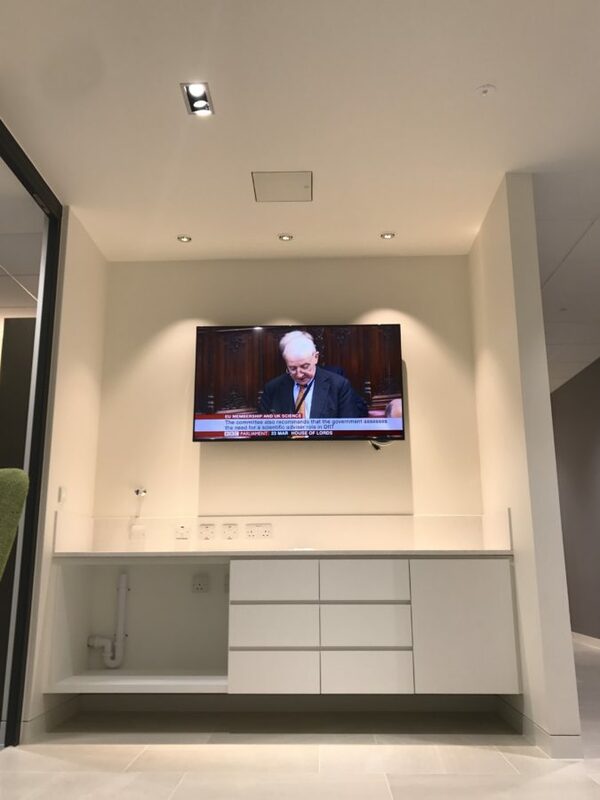 1x Samsung 55” FHD wall mounted on a purpose designed and built line bracket. 1x Samsung 75” FHD in the larger room for use when in combined mode. 2x Shure Microflex Ceiling array, 6x KEF Speakers, 3x Extron DANTE amplifiers, and 10x Harman 4” compact ceiling speakers. 1x Wallmounted Lumens Full HD PTZ USB Camera with a video conferencing codec and Vaddio AV Bridge (located in the central equipment racks with USB extended back to the room for the user’s laptop connection). 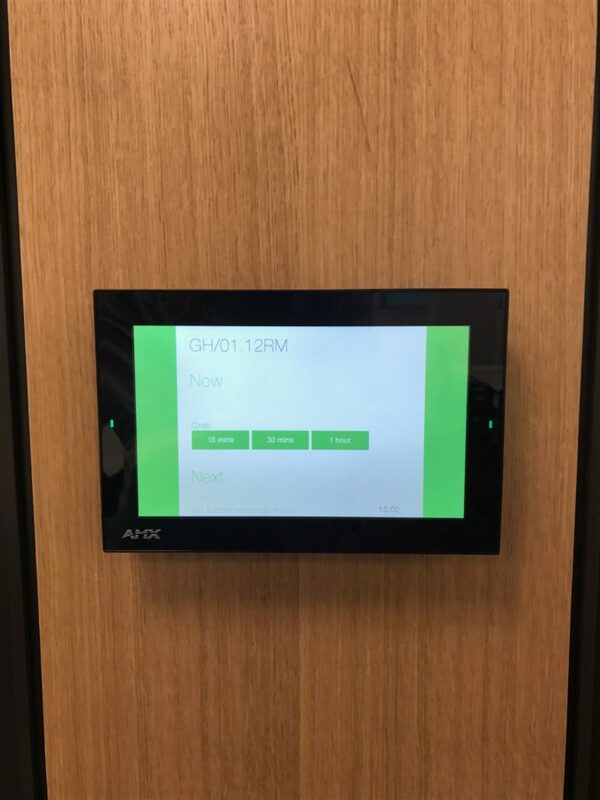 Manhattan room management platform with AMX integration. 7” AMX Modero S Wall Mount Landscape Touch Panel. Realpresence Group 700-720P: Group 700 HD Codec. Four Channels of Microphone / Line-Level Analog Audio Input With 48V Phantom Power. Dante I/O Card Which Provides A Digital Bridge Between Any Dante Edge Network Or Input Sources and the Q-Sys Eco System. Media Station is a bespoke furniture piece designed for flexibility of use. Includes 1x Samsung 32” joinery-mounted display, and wired laptop inputs. Cafeteria carries 1x 55” Samsung FHD display, IPTV receiver, 2x Shure WorkPro ceiling speakers controlled via RS232 or IP interface.